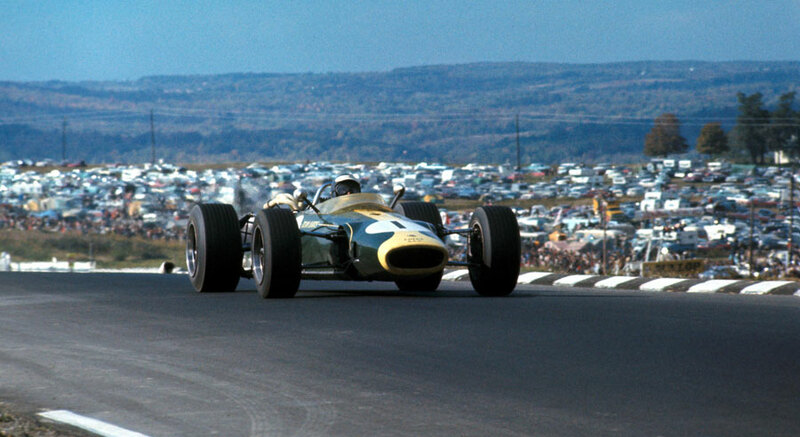 Jim Clark finally overcame the unreliability of his Lotus to win the US Grand Prix at Watkins Glen, although it was not a complete success for the Norwich team as the car had an old engine borrowed from rivals BRM. Clark's own engine had broken down after qualifying the day before the race and his engineers worked all night to ensure he was able to start the grand prix, only finishing ten minutes before the start. The organisers had broken with tradition and chosen not to pay starting money, opting for prize money which totaled $102,000, the biggest at the time in motorsport. Only one Ferrari - that of Lorenzo Bandini - made the trip, while former champion Phil Hill, entered in an American Racing car, missed out when hospitalised on the eve of practice with a hernia. Jack Brabham, who had wrapped up the drivers' championship at Monza the previous month, took pole and dominated the early stages of the race before he was forced to retire with mechanical troubles after 56 of the 108 laps. Clark had almost not started as oil poured from his car on the grid and his mechanics franticly carried out repairs. The fact the local police were struggling to get the crowd back behind the fencing around the circuit bought him valuable time. Thereafter Clark was unchallenged and came home at an average speed of 114.98mph, a record, finishing a lap ahead of a trio of Coopers led by Jochen Rindt who coasted his last lap as he had run out of fuel. "It was 30 laps before I tried to put on any pressure to see what would happen," Clark said. "When I did the car ran beautifully." For all the team's generosity, BRM had a bad weekend. Hill dropped out with suspension problems after 52 laps and a lap later team-mate Jackie Stewart followed suit. Hill's three-year winning sequence at Watkins Glen had been ended, but the BRM engine won for the fourth time in a row! The main drama surrounded John Surtees, who was lying in third when he got stuck behind Peter Arundell's Lotus which was a lap behind - as he tried to overtake the cars touched and slid over the grass and from there into the pits. Surtees climbed from his car to confront Arundell and had to be restrained by Lotus mechanics. After wasting several minutes, Surtees, who by then had dropped to 13th, resumed and eventually battled back to finish third, setting the fastest lap of the afternoon in the process. The crowd of 75,000 included a number of A-list actors, such as James Garner, who were working on the film Grand Prix.